If early morning you need a quiet space, harmony with nature. Come to Bach Vien Cafe, you will feel it. At the restaurant is like a shrunk natural population. 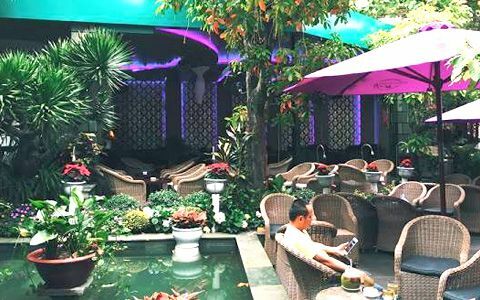 Bach Vien Cafe is located on the front of 2/4 street, Nha Trang, the sign is very large and clear so it is easy to find. Although located on the road noisy car because the bar was built inside to sit very quiet. It’s like being separated from the outside world. There is the only outdoor area, there is no air-conditioned area. Many trees sit very coolly, there are waterfalls murmuring sounds very happy. The menu is extremely rich and varied, always in the menu with illustrations of drinks look beautiful eyes. If you have not imagined the drink or look at the picture is right. Common items such as coffee, Chocolate Blended (40k), Matcha blended with jelly (45k) and peach tea + lemongrass (32k). Apple juice, guava juice, watermelon juice… Drinking glasses are beautifully presented. Chocolate blended drinks are very delicious. Matcha tastes good, has a matcha smell in the jelly. Peach tea + lemongrass is also very good. The price is quite inexpensive compared to other restaurants. Service staff enthusiastic and agile. Will definitely back to support Bach Vien Cafe.